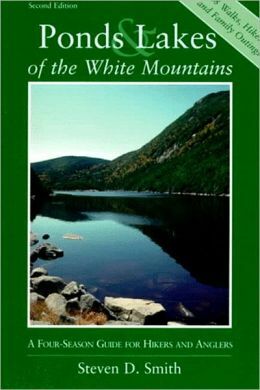 Ponds & Lakes of the White Mountains, by Steven D. Smith, 2nd Edition, 1998. We have this book back in stock after a long hiatus. This guide describes 68 outings to the many and varied water bodies of the Whites, from roadside spots such as Profile Lake and South Pond to backcountry gems like Ethan Pond and Unknown Pond. Includes trailhead directions, trail route details, and descriptions of the ponds and lakes themselves. Also has details on overlooks with "bird's-eye views" of the ponds, notes on visiting in winter, and basic fishing information (including an introduction on trout pond fishing by the late David Nelson). Topo maps and photos for each outing (though print-on-demand photo quality is not the best). Appendix includes full list of White Mountains ponds plus best family hikes, views, sitting rocks, swimming, etc. Note: For updates on trail routes and other items, see "Updates for Ponds & Lakes of the White Mountains" on the "Paths & Peaks" section of our website. 356 pp., 6" X 9."